Mars' Dusty Skies and a "Selfie"
NASA's Curiosity rover has captured a new and stunning view of its current location on Mars. It's a 360 perspective at its location on Vera Rubin Ridge. As you can see, the picture shows reddish brown dusty skies. The skies are darkened by a fading global dust storm that has draped the planet for weeks. 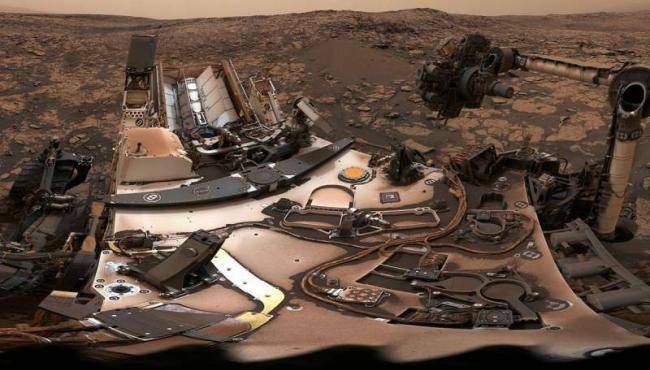 Also there's a very rare "selfie" of Curiosity. And you can see Curiosity's most recent drill target in the foreground. Curiosity has been exploring Mars since 2012. The rover has found evidence of an ancient lake on the planet. It's currently being used to investigate how Mars transformed from a warm, wetter planet that could have sustained life to a dry, icy place. Curiosity drills into Mars' surface because sedimentary rocks hold clues about environmental conditions going back deep into the past.